As I type, I am looking out of a window and I see a porcelain-blue sky, I hear the ascending twiddles and musical turns of blackbirds and finches, and I smell the mouth-watering aroma of the leek and potato soup that’s currently bubbling away on my hob. Yes, as I type, I’m in a bit of a happy place. You see, the clocks have gone forward and the sun has finally come out to play. Spring has well and truly sprung and I’m finally feeling the benefit of actually feeling the sun on my skin. Oh I know it won’t last, something will happen that will bring me crashing down and I’ll be battling on with life as per usual, but in this moment, it’s glorious, it’s peaceful and I’m happy. OK, I’ll admit it. I’ve had a couple of cheeky rum-and-mixer drinks this afternoon (morgan spiced with coke and a golden rum with ginger and lime), just to welcome spring to the Smallest Smallholding, so I’m in no doubt that there’s a slightly rosy glow on everything. I have a pile of freelance work that I need to plough through this weekend. But somehow a blue sky, sunshine and the prospect of summer arriving in a few weeks has got me riding on a bit of seasonal high. I’ve been more inclined to roll out of bed in the mornings and I’m actually getting things done when I’m out of the office and effectively under my own initiative. Today I wrote a list of 10 ‘Things to Do’. First on my list was go for a run, and this morning I went for a somewhat ambling job around my local fields and woods. I felt a little tired, in places it was hard work, I looked like I was about to explode, but it felt so good to be plodding alongside the green hedges, feeling the fresh breeze cooling me down as I made my way up the sunshine-dappled bridleway that flanks the field and woods. The bluebells are on the cusp of bursting into life, and there’s this perpetual birdsong backdrop, and somehow it’s completely energised me. So far today I’ve crossed of 9 of my 10 ‘Things to Do’. Once I get some freelance done tonight I’ll have achieved all I set out to do today. 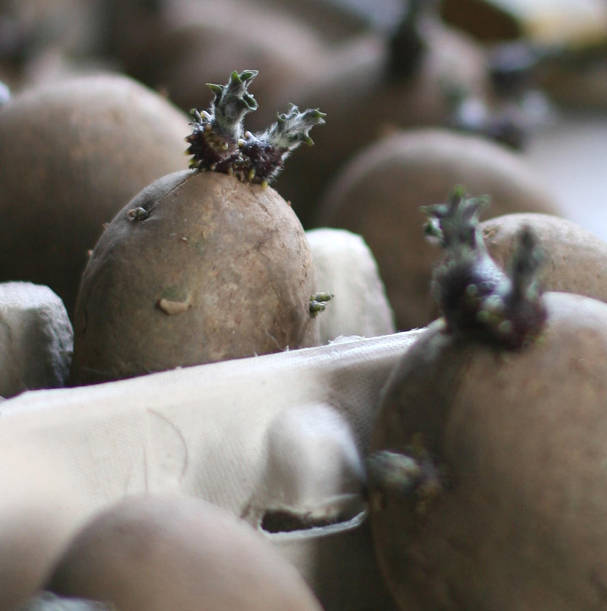 Tonight I’m hoping to add one extra task to the list – planting my Charlotte potatoes in. Last week I started preparing the beds and it shouldn’t take me too long to get them in. They’ve been chitting on my windowsill for a number of weeks now, and they’ve developed some very big, very promising sprouts. I have high hopes for these spuds, and I can picture myself sitting in my new Mediterranean eating area, feasting on a deliciously creamy home-made warm potato salad whilst I catch the last of evening sun. I’ve got a lot of work ahead of me, but this year I think I’m going to nail it. What a wonderful post, I’ve been an avid visitor over the last few years to the smallest smallholding but today I felt I should actually write a reply instead of silently stop by. I just love your talent for bringing words to life! I was almost sitting right there next to you! Anyway, seen as you seemed so full of beans it has inspired me to do a 10 ‘Things to do list’ first thing tomorrow morning, so thank you, I may procrastinate no longer! I put some Charlotte’s in last weekend and can’t wait to unearth those new potatoes in a few weeks. I confess to cracking open the odd bottle of cider now the warmer weather has arrived and it does wonders for that renewed sense of optimism Spring brings! congrats on killing the list. i started off with a list of abut 2 things this morning, now i think it has about 20 things on it and i have only completed one of my original tasks. I know hwat you mean – Its that time of year again, sometimes I think I can feel the garden pushing up out of the ground around me – the weather starts to warm up, the frosts dissapear, a bit of rain and . . . .WHAM – weeds every where and the excuses to do nothing shrivel up in inverse proportion. I have some seed potatoes I bought in a fit of enthusiasm earlier. Now just need to find my wellies. . . . . maybe a cup of tea first. I know exactly what you mean about freelance work cropping up and taking over – more in last post than this one I suppose. I’ve just had some very welcome new work but with the lovely Spring weather I rather resent being tied to my computer, particularly now that the end is in sight. There are seeds to sow, sweet peas to plant, seedlings to cosset and generally Spring to enjoy! We part company on the running front, in that although I know it is very good exercise, I’ve hated it since cross country at school, so give me a brisk country walk any day! Hope your bunny is even better, the potatoes planted, the freelance work tamed and whatever new list you are writing all crossed off! Good luck with the bindweed, hate the stuff, even worse than couch grass. At least you have a clear vision to motivate the clearance work.